From the Official Facebook Security Page – fake toolbars claiming to help you cheat on games that are played on Facebook will steal your password. If you are a Facebook gamer (someone who plays a lot of games on Facebook), then you need to be very careful – and aware – of toolbars that are claiming they can help you cheat if you only download their toolbar. These toolbars will take you through a “profile confirmation” process where you’ll eventually have to enter your password. These fake toolbars are scams that are designed to steal your passwords. 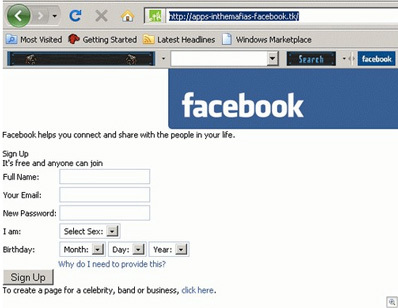 AllFacebook.com provided the images below courtesy of Help Net Security and detail the method of operation of the deceitful toolbars. At first glance, the toolbars look legitimate and appear at the top of your browser, along with a legitimate Facebook logo. The buttons have features that allow for cheating on “Zynga Games” along with other links as well. The best rule of thumb to use here is do not, under any circumstances, download anything from Facebook (or anywhere else for that matter), that you do not 100% trust. And most importantly, careful while playing games on Facebook and your are presented with a “learn how to cheat” toolbar you need to download.